A refugee is any person outside their country of origin or usual residence who cannot return for fear of being persecuted for reasons of race, religion, membership of a social group, gender, sexual orientation or political opinions. The 1951 Geneva Convention relating to the Status of Refugees and Spain's Right of Asylum and Subsidiary Protection Act. We are facing the largest exodus ever known in the history of humanity. All records were broken in 2017. Internal violence, international conflicts and persecution forced over 16 million people to abandon their homes. Of those, 11.8 million became new internally displaced persons and 4.4 million became new refugees. The total count at the end of 2017 was 68.5 million people. Even though the number of people forcibly displaced continues to grow every day in the world, the European Union has opted to strengthen its controls and assign the task of managing its borders to neighbouring countries. The barriers and obstacles that refugees are being met with have been causing a change in the routes they use to attempt to reach a safe country, resulting in increasingly perilous risks. This is not just a number. The lack of legal and safe means of reaching Europe has turned the Mediterranean sea into an enormous mass grave. The memorial 'Som i serem ciutat refugi' [a city of refuge, now and always], located at the Barceloneta beach, profiles and pays homage to all victims and is an urgent call for a safe passage to be established. Data is to be updated periodically. 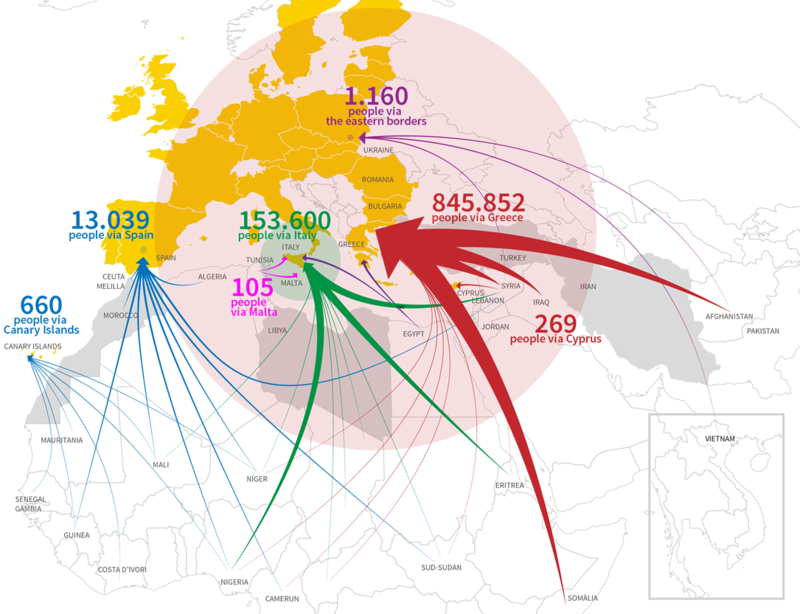 Map showing the flows of people that reached, or tried to enter, the European Union in 2015. It shows the countries of origin and the countries of provenance. A total of 845,852 arrived in Greece, 153,600 in Italy and 13,039 in the Spanish State. The figures are from the UNHCR, the International Organisation for Migration (IOM) and the European agency that controls external borders (Frontex).